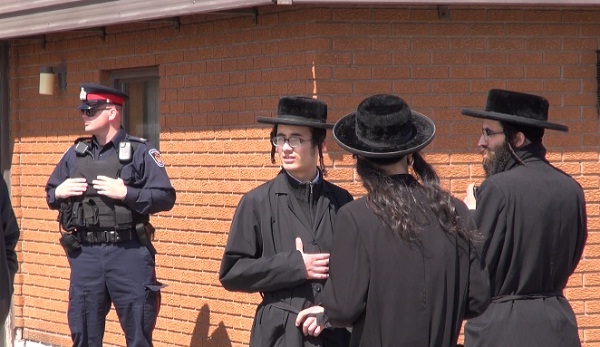 A Chatham-Kent police officer stands guard at the Lev Tahor community north of Chatham. Photo taken on April 2, 2014 by Ashton Patis. The youth centre declined to comment further as members of the ultra-orthodox Jewish sect await a judge’s decision in an on-going custody case involving 14 children. The children and their parents fled Chatham-Kent after an Ontario judge upheld a Quebec court order forcing them into foster care. Six are in Guatemala where they are reportedly seeking refugee status, six were apprehended in Trinidad and Tobago and another two were discovered at the Calgary International Airport. A 17-year-old girl has since been released from custody, but her infant child remains in foster care with a Jewish family near Toronto, as do the other children. A decision in that case is expected on Monday. Leaders of the ultra-orthodox Jewish sect continue to deny all allegations of child brides, forced marriages, neglect and abuse.